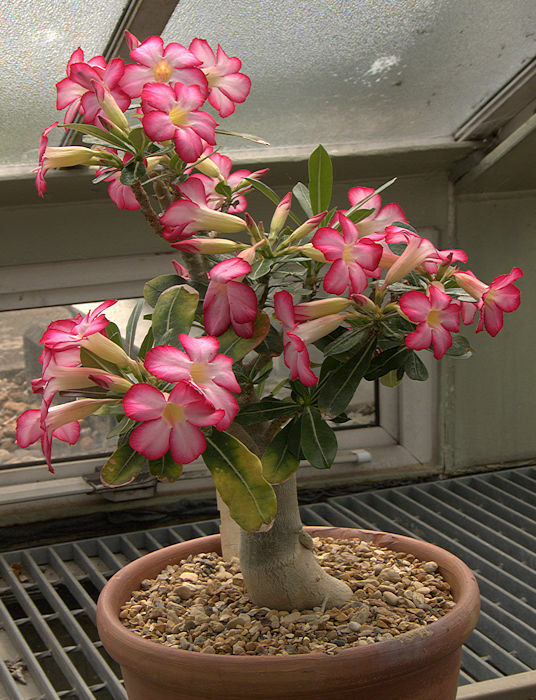 Adenium is a monotypic genus for a variable caudiciform species, Adenium obesum, with at least 6 recognized sub-species that may be encountered on labels as distinct species. The trunk and stems are spineless, unlike those of Pachypodium. As with other members of the Apocynaceae (Dogbane Family), the showy white, pink or red flowers have 5-fold symmetry. The thick trunk up to 15 ft tall, produces clusters of dark-green oval leaves with a pronounced mid-vein. 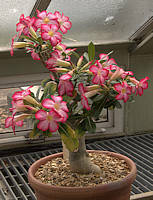 Native to Arabia, Socotra and tropical Africa and naturalised elsewhere across the tropics. The flowers have five petals in white, pink and red with horticultural selections and hybridisation producing bi-coloured, striped and double flowers. Even yellow and black (dark purple) flowers are now available. 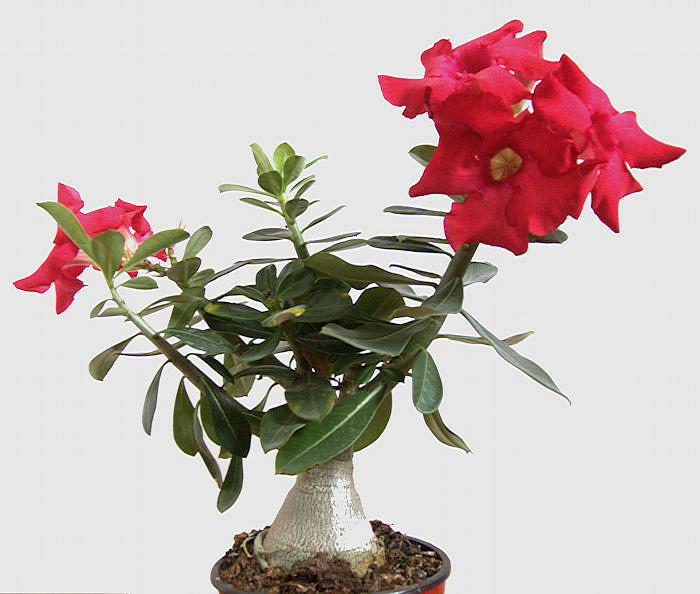 Adeniums are widely grown as tender houseplants and will not tolerate any frost or even cold conditions. A very free-draining potting mixture should be used and even then the plants should be watered carefully. Much work has been done to produce a variety of showy cultivars by hybridising between the different sub-species. Desirable varieties will probably not come true from seed so they are propagated by grafting as cuttings may be slow to produce the attractive bottle-shaped trunk. Adeniums contain cardiac glycosides and should be regarded as poisonous. They have been used as components of arrow poisons.